After months of waiting, you can finally view Nintendo's Miiverse social network from the comfort of your favorite web browser. When Nintendo first announced Miiverse, it was heralded as the solution to all of the firm's baffling issues with establishing a viable, forward-thinking online identity. Microsoft has Xbox Live, Sony has the PlayStation Network, but for the entirety of the moribund current console generation Nintendo has been saddling players with the archaic Friend Code system. Realzing it needed to take to take a strong, decisive leap into whatever century this is, Nintendo lifted key design ideas from Facebook, and the two aforementioned gaming services, to create a new system that is simultaneously social and yet decisively focused on gaming. Of course, as with all social networks, things weren't quite as rosy as they initially seemed. Nintendo promised long ago that we'd be able to access Miiverse from any web browser, but for the longest time the only way to view your friends and share crudely-drawn illustrations was by firing up the nearest Wii U. That all changed yesterday though, as Nintendo revealed the Miiverse web portal, a simple site that functions exactly as you'd expect. From the web-enabled Miiverse, you're able to view your friends list, chart your gaming activities and read comments from the various games' communities - basically everything you can do from the Wii U iteration of the service, save actually playing games. If you'd like to take a look at the service for yourself, it's as simple as clicking the URL linked at the bottom of this article. Once there, you'll need to enter your Nintendo Network ID and password, and then you're set. Easy peasy. You'll still be able to comment to posts, check out communities, and give Yeahs, among other features. This means you can take Miiverse on the go, so you'll never have to be away from it again. ... or maybe he doesn't. 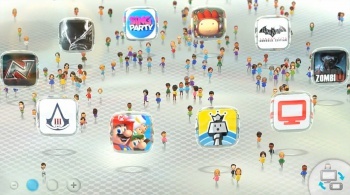 So, who's excited to see Miiverse on the 'net? Cynicism aside, this does seem like a positive first step for Nintendo. Now if only the company can expand Miiverse at a rapid clip, the firm could really get a leg up on the competition, whose next-gen online offerings are still largely a mystery.